This week’s game against the Georgia State Panthers may not have the hype last week’s game had, but that’s why this can be a dangerous, early season trap game. The Ducks are emotionally and physically drained after travelling to East Lansing and getting in a dog fight with the Spartans. The Pac-12 season also starts for the Ducks next week, so let’s hope the team is not looking past the Panthers. On offense, the Panthers have their quarterback, top three rushers, and nine of last year’s top 10 receivers returning. On defense, the Panthers return enough experience to get the Ducks’ attention. A veteran team is always primed to generate upsets. The Panther offense loves the trips formation. 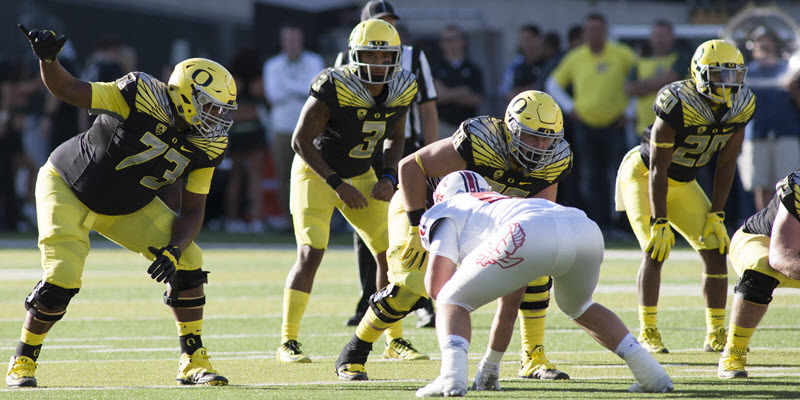 The Panther offense looks similar to the Ducks’ in the sense that they attack the spaces on the field and try to force you to make small mistakes — hopefully adding up to a big enough passing lane for the quarterback and receivers to work. This first play is run from the trips right formation, as you can see above. The defense on the other side is lined up in a 4-2-5. The trips formation takes advantage of spacing routes. The trips formation is often used to create confusion in zone coverage. As a reference for later, the outermost receiver is the No. 1 receiver; the middle one, No. 2; the innermost, No. 3. So, the No. 1 receiver is going to run a go route with the No. 2 receiver running a drive route, above. The No. 3 receiver is running a delayed hitch/smash route. It’s an easy dink and dump for the quarterback. Trips is going to make it difficult for the defense to keep track of the receivers, and the perfect execution by the Panthers makes it all that much harder to defend. The quarterback sees the confusion and finds his first read, the No. 3 receiver, for a solid gain. The Panthers are going to have to try anything and everything to get a win, so don’t be surprised if you see the quarterback pump fake short and throw the deep ball to the No. 1 receiver. Out of the trips formation, the Panthers also run the read option. Georgia State also loves the read option. Let’s take a look at a play from the third quarter. As you can see above, the Panthers are in trips again with the quarterback in the gun and the running back to the left of him. The defense is lined up in a 4-2-5 defense, again. Reading the right end, the Panthers’ quarterback decides to pull it. With the snap, the Panthers’ offensive line is running a zone blocking scheme, leaving the right defensive end unblocked as the read man. 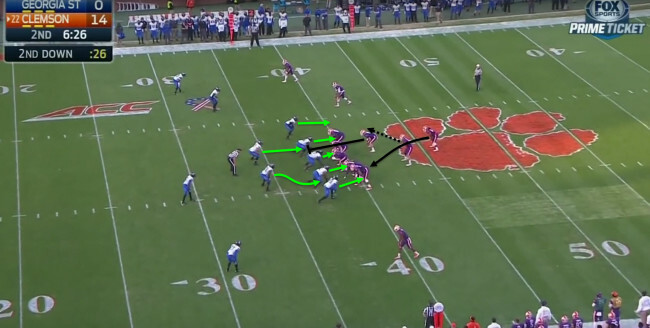 The Clemson defensive backs are forced to stay with the receivers since the Panthers have been successful throwing the ball out of the trips formation. The quarterback has plenty of room to run in front of him. On the read, the quarterback sees the right end go for the running back. So, he pulls it and has plenty of green in front of him thanks to the success of the passing game out of trips. The result of the play is a much needed first down for the Georgia State offense. The Georgia State defense is going to have a tough time stopping the Ducks’ offense if the Ducks are focused. If they aren’t though, the Panthers’ defense may be able to make a few plays and force a few turnovers to get some momentum. The Panthers’ defense has to be on top of its game to have a chance of getting a win. Let’s take a look at a somewhat similar read option from the Clemson game. The Panthers’ defense is lined up in a 4-3 formation with the left outside linebacker up at the line of scrimmage. As is the case with most teams, the linebackers are going to be the key to stopping the zone read. Linebackers are going to be filling the gaps to stop the option. 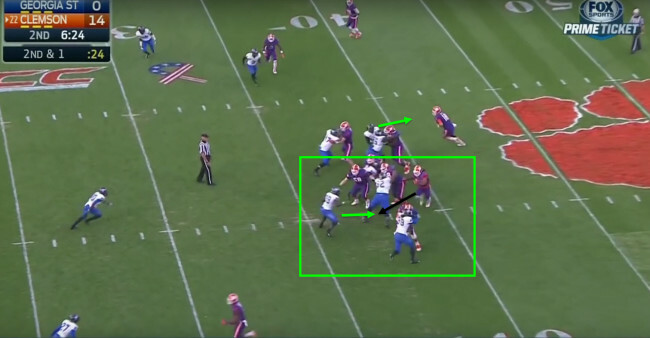 At the snap, the left outside linebacker is going to be the read man and is going to take away the quarterback run with relative ease. The defensive line is simply rushing straight ahead trying to push the offensive line into the backfield. The middle linebacker is filling the hole in the strong side B gap, while the right outside linebacker is filling whichever hole opens up for the running back. The Clemson running back is stopped for a gain of 3 yards. 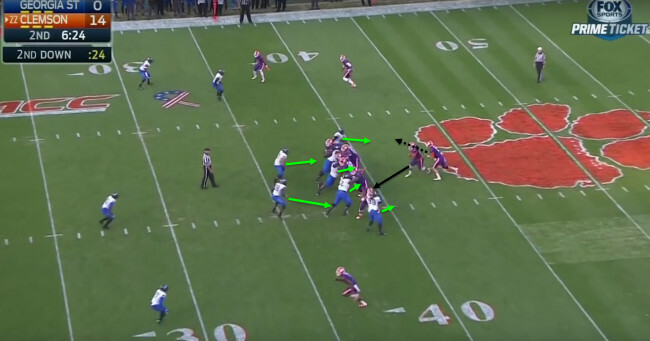 As you see above, the weakside B gap opens up for the running back and the right outside linebacker does a great job of filling the hole and stopping the Clemson running back for a gain of only three yards. The three starting linebackers are returning for the Panthers along with myriad other defensive starters. This is a very experienced Panthers team and they should be able to avoid making major mistakes, forcing Oregon to beat them straight up. As much as I’ve said the Georgia State defense is going to struggle to stop the Oregon offense, the Ducks’ defense hasn’t fared much better. Both defenses have allowed an average of 469 yards per game and the Oregon and Georgia State offenses have gained 582 and 487 yards per game, respectively. Despite all the similarities between these two teams, the Ducks are too talented to fall to the Panthers; Ducks win 55-31.